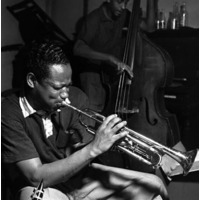 Clifford Brown (October 30, 1930 – June 26, 1956), aka "Brownie," was an influential and highly rated American jazz trumpeter. He died aged 25, leaving behind only four years' worth of recordings. Nonetheless, he had a considerable influence on later jazz trumpet players, including Donald Byrd, Lee Morgan, Booker Little, Freddie Hubbard, Valery Ponomarev, and Wynton Marsalis. He won the Down Beat critics' poll for the 'New Star of the Year' in 1954; he was inducted into the Down Beat 'Jazz Hall of Fame' in 1972 in the critics' poll.